August 4, 2012 / Jeff d.
I am a country boy; this is important for two reasons. First, our well water is so terrible that we have to buy our drinking water. (Although I suppose a true country boy would choke that rust-laden crap down – and like it). Second, this country boy doesn’t go to the store to buy bags of ice. 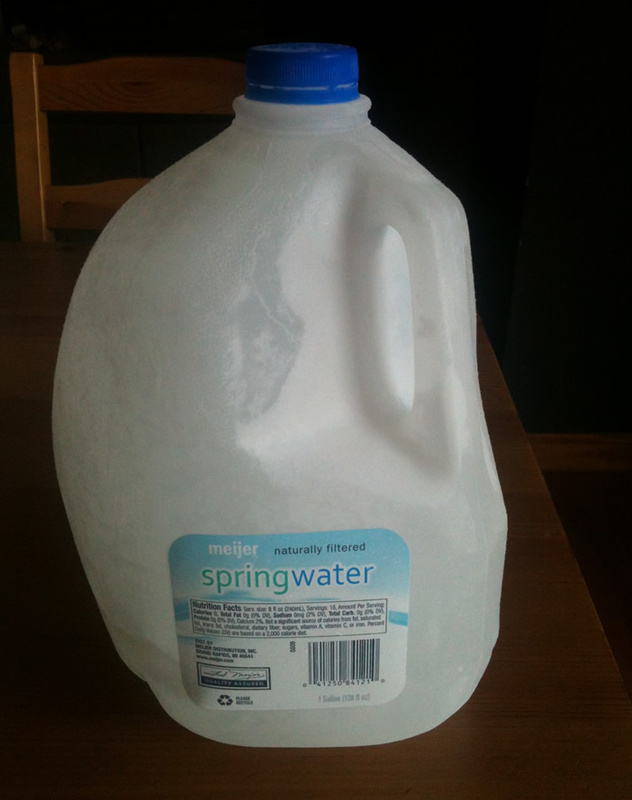 Instead, I simply take the empty water jugs, refill them and put them in the deep freeze. 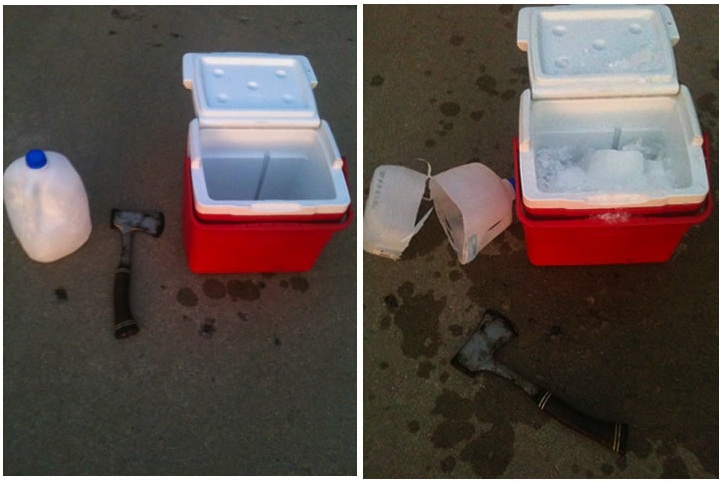 When I need some ice for the cooler, I take a jug, bash it up and hack it open with a hatchet, and bam! The equivalent of a bag of crushed ice. 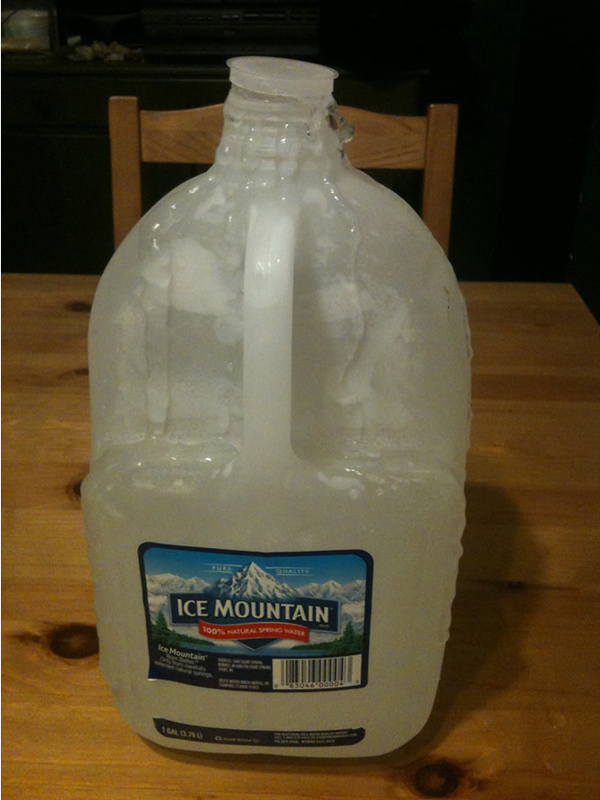 So the problem is this: after figuring out how much water expands when it freezes (I believe it’s about 9%), let’s use our knowledge of volume of various figures to find the magical level to fill a jug so it will be full, but won’t explode. One of my favorite problems when we are learning about volume is loosely based on this Formative Assessment Lesson from the Shell Centre. The students are given a series of glasses of various shapes, and they figure out which glass will hold the most liquid. Next I have them guess which glass holds the most liquid when it is two-thirds full (by height), and figure that out as well. This jug problem is similar – the shape of the various jugs can be thought of as compound figures; we already know their volume (or do we? See picture below). Now the trick is to figure out the point at which it is about 91.75% full (to account for the 9% expansion). Depending on the shape, it almost certainly isn’t 91.75% of its height. 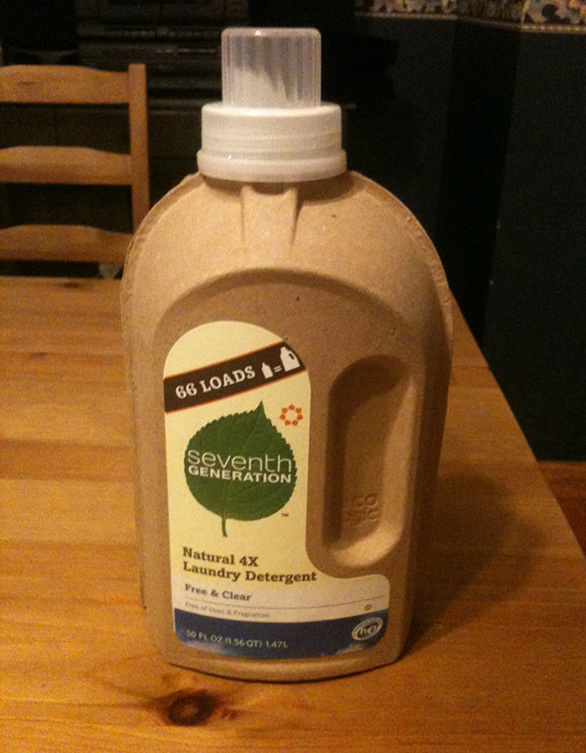 What about those weird circular indentations on milk jugs – won’t they expand outward? Or any unfilled space they leave at the top? At this point, the problem can be extended to nearly any container. A bottle of dishsoap? Let’s give it a shot. That bottle of Mountain Dew? Go for it. And what about this strange thing? It’s got some properties of a cylinder…doesn’t it? I like messy problems, and this is definitely messy (and I’m talking about the math here). What exactly is the shape of a milk jug? Can we consider the lower portion to be a rectangular prism? How do we account for the curves? The handle? Is the top close enough to a truncated pyramid? Part of a sphere? Any student can have input, any student can find a way to justify their solution, and these are the kinds of discussions that I love. And the best part is that the 3rd Act, if you will, can be easily tested. Each student can pick a container from home, provide calculations to justify where they are going to fill the bottle, then throw it in the freezer. Hopefully they get it right and I don’t have a bunch of parent complaints about explosions in their freezers. ← It wasn’t Twitter that convinced me!